We recently viewed Alessi’s latest collection of products, and this is one that caught our eye. 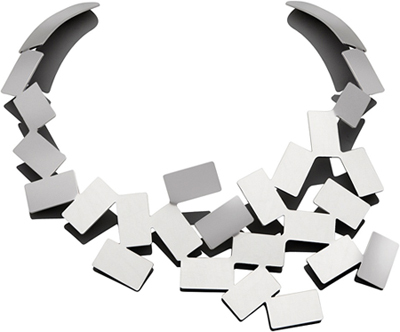 This Fiato sul Collo necklace by Mario Trimarchi comes with a story. The piece is inspired by the harsh Scirocco winds from Trimarchi’s early life in Sicily, with small, rectangular metal card pieces combined creating this asymmetrical piece. This piece is part of a series called “La Stanza dello Scirocco” including baskets, vases, candle holders and more.